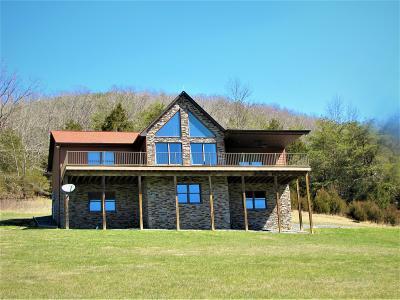 Welcome to this 4 bedroom 3 bath well built home (2010) on 103.50 acres by deed. Home was Built with hardy plank siding which is maintenance free and fire proof along with architectural shingles and beautiful M-Rock over the block foundation: this 2 story home is a sight to see! Dual heat pumps for upper and lower level. Floors are carpet, ceramic tile, and hickory hardwood. Kitchen and bathrooms have granite counter tops. Kitchen has recess lighting and local made custom wood cabinets. Large Amish made building -32 x 48- metal with gravel floor. Land has approx 20-30 acres open 2 ponds, a couple springs, food plots planted and much more. Eastern turkey, whitetail deer, black bear, small game abound. Bring your animals, and hiking shoes! some really neat rock faces! Call today!